To help individuals with high level disabilities obtain wheelchair accessible vehicles needed to get to work and achieve their dreams for independence. Bring you cars! Bring your family! And don’t forget to come hungry! We are thrilled to announce our 2nd annual Drive For Independence Upshift Summer Bash. This year’s event will be held at Leg Up Farm, 4880 N Sherman Street Ext, Mt Wolf, PA 17347, on Saturday, August 1 from 3pm-9pm. It is a car show, food truck and vendor event. There will be plenty of beautiful cars, food vendors to tempt your taste buds, plenty of vendors to pique your interest, and the Rock ‘N’ Roll Express DJs to keep the party going. The Upshift Summer Bash is a fundraiser for Drive For Independence, a new organization in York PA to help adults with high level disabilities get wheelchair accessible vehicles to get to work. We are working towards the costs of becoming a 501(c)3 organization. Our sponsors and vendors help us to make the Upshift Summer Bash possible. Our platinum Sponsor is Apple Nissan. With their help we are bringing an awesome activity to Upshift Summer Bash. New this year we will have RC2U bringing their mobile RC race set up to the show. There will be tickets available at $3.00 per race, 2 races for $5.00 or wristbands for $10.00 to race all night. All proceeds from the ticket sales come to Drive for Independence. It will be great fun for the young and young at heart! We also have several Gold (trophy) and Silver Sponsors helping to make this year’s event a success. Ida Automotive and Preston Tucker LLC are 2 of our gold sponsors this year. 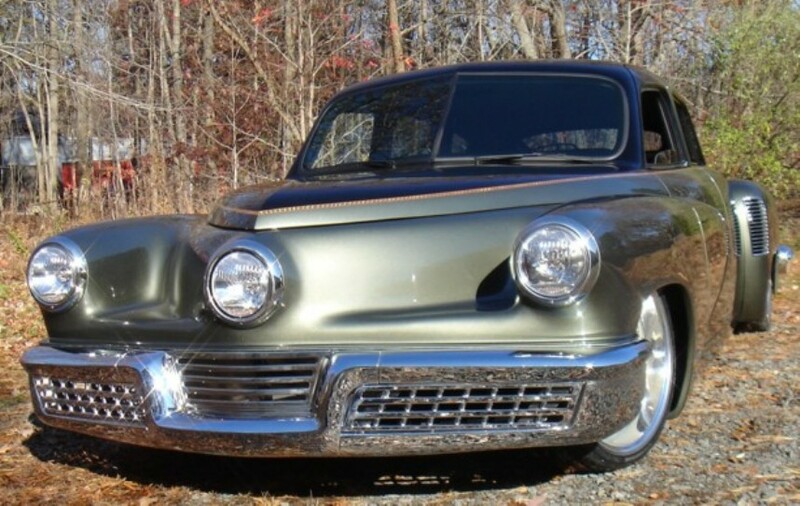 They are currently in the process of building what was the Tucker Torpedo concept car. Sean and Mike Tucker (Preston Tucker’s great grandsons) and Rob Ida who specializes in custom car builds will be on hand. Our other gold sponsors are Ride- Away, Mobility SVM, who will hold the first owners group meeting in conjunction with our event, and Aadvantage Insurance. One trophy is being dedicated in Memory of Tyler Shumate, who lost his life earlier this year in a car accident. Silver sponsors include Amsoil by Mike Marx , Saba for Life by Kala Sechrist, and Royal Manchester Golf Links. Hungry? We will have Spectrum Farm to Truck to fill your bellies and Snow Stables Shaved Ice to cool you down. We are continuing to add food choices so check out the Facebook event or WordPress for updates. There will also be a bake sale that will benefit Drive for Independence. We also have vendors for all your shopping needs! Favorite direct sales companies, such as Perfectly Posh, and home crafters will be on hand to satisfy your shopping fun. We would love to fill our show field with 150+ Cars, trucks and motorcycles. Pre-register your vehicle by visiting: https://squareup.com/market/christopher-sauerbaum/upshift-summer-bash-registration. Use code USB2015 at check out for $5.00 discount. You can also pre-register by going to the link below and printing out the mail-in registration. Pre-registration is only $10.00 while the day of the show registration is $15.00. We will have 1st-3rd, best motorcycle, and best truck custom trophies designed by Chris Sauerbaum for the show field that will be judged by your fellow car show participants. There will also be a People’s Choice trophy voted on by the general public. The first 50 registered cars will receive a dash plaque and we will have 150 reusable goody bags to be given away. Chris is definitely showcasing his graphic design abilities with this show. We will also have a silent auction with items up for bid such as a round of golf for 4 (a $200 value) from Royal Manchester Golf Links, an Amsoil oil gift certificate, a family fun pack including a bowling gift card and movie passes and many more! We will also have activities for the kids including the large barrier-free playground, color your own car and face painting! We will continue to grow the Upshift Summer bash bigger as Drive For Independence grows. We are taking everything we learned from fund raising for Christopher Sauerbaum’s Wheelchair accessible truck and helping others in a similar situation achieve accessible transportation for work. For more information please see https://driveforindependence.wordpress.com/2015/02/27/announcing-2015-upshift-summer-bash/ or our Drive for Independence Facebook page http://www.facebook.com/driveforindependence. To make a tax-deductible donation please see http://www.philanthropicendeavors.org/ and mark Drive for Independence in the Paypal notes section. We can be reached at driveforindependence@gmail.com or 717-991-5921. These guys are true car builders! We can’t wait for you to meet them at the UPSHIFT Summer Bash. 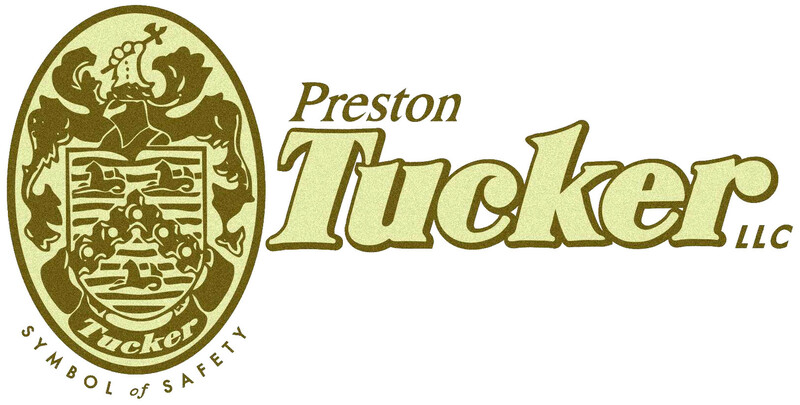 IDA Automotive and Preston Tucker LLC are 2 of our Gold sponsors. Take a few minutes and watch it. We are excited to announce our sponsorship opportunities! If you are interested in being a sponsor please contact us with your email address and we will send you the letter below. We now have fiscal sponsorship so your sponsor donation is tax deductible. Drive for Independence is an organization dedicated to helping individuals with high level disabilities obtain wheelchair accessible vehicles needed to drive themselves to work and achieve their dreams of independence. We have already helped one individual achieve his dream. Christopher Sauerbaum along with his wife and many other dedicated individuals have raised the funds for a down payment on his vehicle which will soon be converted for his specific needs. After meeting his goal they decided to immediately work on paying it forward and helping others meet this same goal of being able to drive themselves to work and lead an overall more independent life. 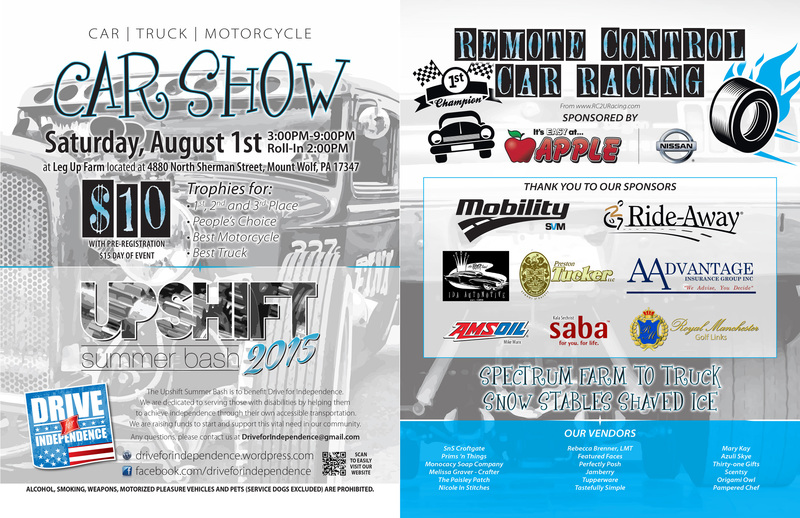 Our annual car show is one of our largest fundraisers. Upshift Summer Bash 2015 will be held on Saturday, August 1, 2015 at Leg Up Farm and will showcase a variety of vehicles including cars, trucks and motorcycles with everything from classics to tuners. To make this year’s event an even larger success than last year we are seeking the support of business and private sponsors. There are several possible ways to support this event including Sponsorship, donation to the raffle, and door prizes. We are also accepting donations to the raffle to be held during the event. The items will be on display throughout the event for the public to bid on. Each item will include a card with information about the item including the value and who it was donated by. Corporate sponsorship is not necessary to make a donation to the raffle. All donations are greatly appreciated. Gold and Silver Sponsorship Levels and in Memoriam Trophy Sponsorships are limited and will go on a first come basis. We encourage all interested sponsors to return the sponsorship form as soon as possible, but no later than June 1, 2015 to ensure inclusion of your logo on promotional materials. We thank you for your consideration in supporting our Upshift Summer Bash 2015 and ultimately our mission with Drive for Independence in helping individuals with high level disabilities reach their goal of being able to drive themselves to work and achieve a new level of independence. We look forward to seeing you join us at the Upshift Summer Bash 2015 being held at Leg Up Farm, located at 4880 N Sherman St Ext, Mt Wolf PA 17347. □ Yes, I’d like to donate an item to be used for the Silent Auction/Door Prizes. Logo must be in .JPEG, .PSD, or .EPS format and at least 150dpi (300dpi preferred). Please e-mail your artwork to: driveforindependence@gmail.com. Sponsorship form and checks made payable to “Philanthropic Endeavors” with a memo line of “Drive for Independence” may be mailed to address below. Any questions please contact me via email at driveforindependence@gmail.com. We are at it again! Cars, food trucks, craft/ home business vendors, and a huge playground for the kids means the second annual Upshift Summer Bash is a recipe for fun for the entire family! Join us Saturday August 1St 3-9pm at Leg Up Farm in Mt. Wolf! It’s Official! Chris’s Drive For Independence Has Reached its Goal! Thank you to everyone who made our very first car show a success! We may not have reached our goal but we are less than $1,000.00 away from our goal! We are still proceeding forward with getting Chris’s truck. It will still be a couple months until we are given the go ahead to get the truck by OVR so there is still an opportunity to get there. Thank you to the food trucks and vendors who gave their support in our first year. You took a gamble on us! We can’t say thank you enough for being there to support us! Thank you to the vendors who came out to share the day with us. Thank you to all the car guys, including some of the Visual Reality Car Club, and three special Johns (John O., John Sheldon, and John Burch) that came out to support! Chris This event was about bringing the community out to help one of its own reach his dream! The Upshift Summer Bash raised $1,209.00 leaving us just $800.00 shy of our goal. We thought we were proceeding forward without reaching it. That all changed this morning at 9:30am! I was expecting email from Ride-Away who was part of our event. Imagine my (Heather’s) surprise when I looked in my email and there was a donation the completed our goal and exceeded it! I just about hit the floor I was so shocked! Chris was sleeping and I woke him up with my hysterics! At least it was a great reason, right? Thank you again to everyone who has helped us reach our goal! It was so much a community effort! It now puts us very close to Chris’s Dream of Driving. OVR paperwork is in the works and hopefully as long as all goes to plan we will have his truck in 4-6 months! Sooner is better than later but after a 10 year wait this will be nothing! What a way to celebrate Chris and I being together for 10 years! What an awesome gift and one we will never forget!!! Bring you cars! Bring your family! And don’t forget to come hungry! We are thrilled to announce our first annual Drive For Independence Upshift Summer Bash. This year’s event will be held at Leg Up Farm, 4880 N Sherman Street Ext, Mt Wolf, PA 17347, on Saturday August 16 from 10am-4pm. It is a car show, food truck and vendor event. There will be plenty of beautiful cars, several food trucks to tempt your taste buds, plenty of vendors to pique your interest, and DJ-T1 to keep the party going. The Upshift Summer Bash is a fundraiser for Chris Sauerbaum and his need for a wheelchair accessible vehicle. He has had his driver’s license for 10 years now without a vehicle to drive. We are working towards a $10,000.00 down payment on a Mobility SVM Chevrolet Silverado. We are currently at $8,000.00 and hope to reach our goal with the Upshift Summer Bash. Ride-Away Wheelchair Vehicles will be bringing a Mobility SVM vehicle to showcase what we are fundraising for. Did someone mention food trucks?! Of course we did! We will have Bountiful Feast, Scoops Ice Cream and Grille, Smoothie King York, PA, Spectrum Farm to Truck, and Sophie’s Italian Ice to fill your bellies and cool you down. We also have vendors for all your shopping needs! Favorite direct sales companies and home crafters will be on hand to satisfy your shopping fun. The car show can accommodate up to 100 vehicles in the car show field. Cars, trucks and motor cycles are welcome. Pre-register your vehicle by visiting: https://driveforindependence.wordpress.com/2014/06/13/upshift-summer-bash-car-show-registration/. Pre-registration is only $10.00 while the day of the show registration is $15.00. We will have 1st-3rd custom trophies designed by Chris Sauerbaum, himself, for the show field that will be judged by your fellow car show participants. There will also be a People’s Choice voted on by the general public. Chris is definitely showcasing his graphic design abilities with this show. There will also be an event photographer on hand and you will be able to get a photo of your car at the event. Donations from photos will go to YAFCA, a local community organization (www.facebook.com/YAFCA.org). We will also have a silent auctions with items up for bid such as A York Revolution Prize pack that contains 4 ticket vouchers, SnS Croftgate car care items, $100 in free Web design, and massage gift certificates and many more! We will also have activities for the kids including the large barrier-free playground! We hope to bring you this event bigger and better in the future as we turn our efforts to begin our 501(c) charity efforts with Drive For Independence. We would like to take everything we have learned fundraising for Christopher Sauerbaum’s Wheelchair accessible truck and help others in a similar situation needing accessible transportation for work. For more information please see http://www.driveforindependence.wordpress.com or our Drive for Independence Facebook page http://www.facebook.com/driveforindependence. To donate please see http://www.gofundme.com/driveforindependence. We can be reached at driveforindependence@gmail.com. Car and Vendor registration for Upshift Summer Bash is now open! Our Upshift Summer Bash is scheduled for Saturday, August 16, 2014 from 10am-4pm. We are looking for vendors and car show participants. Our goal with this show is to reach our $10,000.00 down payment goal towards Chris Sauerbaum’s Mobility SVM Chevrolet Silverado. We are hoping to raise $3,000.00 with this event. Anything above and beyond our goal will go to help offset the cost of the vehicle which is approximately $50,000.00. We would like to make this an annual fundraiser with Drive For Independence when we start our 501(c) to help other people reach their goal of driving. We are looking for 40 vendors of all varieties, including direct sales, crafts, and car related products. The price per spot is $35.00 or $25.00 plus a silent auction item worth at least $15.00. Set up for vendors will begin at 8:00am. We are also looking for those interested in being in our car show field. Registration is $10.00 per vehicle to pre-register up until August 9th. We are able to accommodate 100 vehicles. If there is room open the day of the show registration is $15.00. There will be trophies for 1st-3rd judged and a people’s choice. Roll-in will be at 9:00am. We will be taking vendor payments and car show payments via cash, check, or PayPal. Please contact us for PayPal instructions. For an application please contact us at http://www.facebook.com/driveforindependence or driveforindependence@gmail.com. 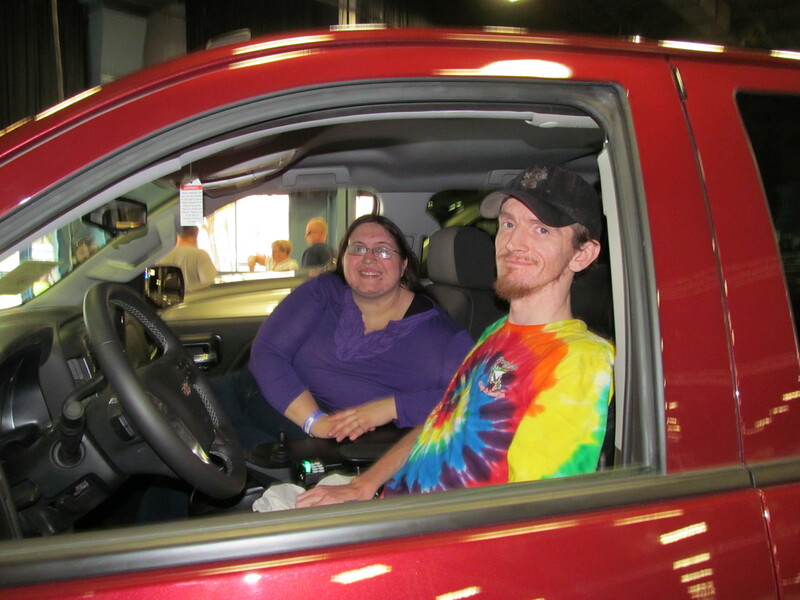 Chris and Heather testing out the 2014 Mobility SVM Silverado at the New York Metro Abilities Expo in May.